The 3rd week of October, known as National Business Week for Women, is set aside as a time to honor and celebrate the contribution of women in business. Take a moment and share with women on your team as well as those you know personally, the movie Oil for Your Lamp, as a reminder that taking care of themselves is a must for success professionally and personally. Send a kind reminder to the women in your lives that encourages them that taking care of themselves is important and helps them as they care for the other important people in their lives. 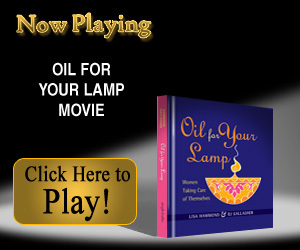 Enjoy 3 minutes of encouragement as you view the movie, Oil For Your Lamp. Oh, Thank Goodness, It's Not Just Me! w/Free Dvd by BJ Gallagher and Lisa Hammond - Women today face more challenges than ever, accompanied by feelings of being overwhelmed and spread much too thin. More and more of us are raising our hands and speaking up, telling the truth about how we feel. And as we do, other women are saying, "Me too! Oh, thank goodness I'm not the only one!" Includes a wonderful 3 minute DVD. Life Begins When You Do, by Mary Anne Radmacher - Are you putting off living the life you've always longed for? Mary Anne Radmacher gives you an inspiring invitation to begin the true work of your life right now in Life Begins When You Do. Courage Does Not Always Roar w/Free Dvd by Bobi Seredich and foreword by Mary Anne Radmacher - A highly inspirational book about ordinary women with extraordinary courage. The incredible stories about women fighting through challenges in their lives will give you goose bumps, and will provide timely shots of inspiration, when you need it most! •Timeless widsom shared from great women from all over the world and all walks of life are discovered in this handsome quote book. •Not just a book for women, this quote book will inspire, comfort and motivate. People love quotes! Why? Because with a quote, just a few words can capture the essence of a great idea. When you read it you think "wow"...that's exactly how I feel; an "a-ha" moment has arrived. Great Quotes From Great Women is a beautiful book is filled with "a-ha" moments from great women throughout history. Let's just call it timeless wisdom that has the potential to inspire, to comfort, to persuade, to motivate...or change the way you think about life. Included within are women from all walks of life. Their passion and persistence have advanced womanhood and the world. These are lives and words worth remembering. This wonderful book will make a treasured gift for any occasion. You gain strength, courage and confidence by every experience in which you stop to look fear in the face...you must do the thing you think you cannot do. Men their rights and nothing more; women their rights and nothing less.